Star of Hope has a project in a small village, Ilog, just outside of Infanta on the East coast of the Philippines. It is about 3 hours by car from the capital, Manila. Star of Hope Philippines has worked here since 2004 when the area was hit hard by four typhoons that claimed 2,000 lives and deprived tens of thousands of survivors of the few possessions they had. Illegal deforestation resulted in a large flash flood rushing down from the mountains. With the flood came logs and other debris that smashed up most things in its path. The power of the flood was enormous. Within a week of the disaster, Star of Hope started distributing emergency aid to more than 1,500 families. We also assisted with the support for the reconstruction of several homes. The decision was made to commit to a long-term involvement. In 2006, a completely new village was built with housing for over 300 families; the village was rebuilt further away from the mountain. People who had lost their homes and livelihoods during the typhoon moved there. Today 3,000 people live in the village, named Ilog. In 2009 the village school was inaugurated. A school in the village is important to keep the people from abandoning the village and moving to one of Manila's many slum areas. The goal of the school is to provide children in Ilog and surrounding villages new possibilities for a brighter future. At the school, the children are taught according to the curriculum used in the Philippines; reading, writing, English, Tagalog (Filipino), Christianity, natural science, mathematics, physical education, and crafts. They also learn to think independently, learning about democratic values and human rights. The school also gives the children with a place where they have time to play and rest. In addition to education, the children receive basic care for simple treatments. Children must also learn personal hygiene, which in turn prevents diseases and leads to better health for children. The school also provides the children's parents a safe place to leave their children during the day while they themselves work and obtain a much-needed income for themselves and their families. School lunches are also served to help prevent malnutrition in children. New Prospects So far, the grades in school are one through four but Star of Hope Philippines hopes to extend the school to at least sixth grade. In addition to classrooms, there are proper toilets, running water, library and a school playground. On various occasions, the school which is built to withstand storms had to act as an evacuation center when typhoons swept across the area. Our support goes towards the school but we are working with leaders in the village to improve the situation for the children. We have distributed goats and chickens to some of the families. Others have been supported to launch small income generating activities. Because of the Star of Hope school, there is a sense of optimism and confidence in the village. The children will have an education –and because of it better prospects for the future. Join and give a child a start! 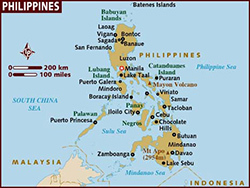 Language(s): Philippine (tagalog) is the most spoken. Many speak English. Primary Exports: Electronic equipment (computer chips and microprocessors), Copper, Sugar and Timber.